Netsoc reveals new societies website "Lowdown"
The Networking, Gaming and Technology Society (Netsoc) today unveiled a new website for helping students keep track of society events. Named Lowdown and located at lowdown.netsoc.co, this website provides a number of useful services relating to societies including a weekly email newsletter, integrations with phone calendars, and the option to filter these features by students’ favourite societies. 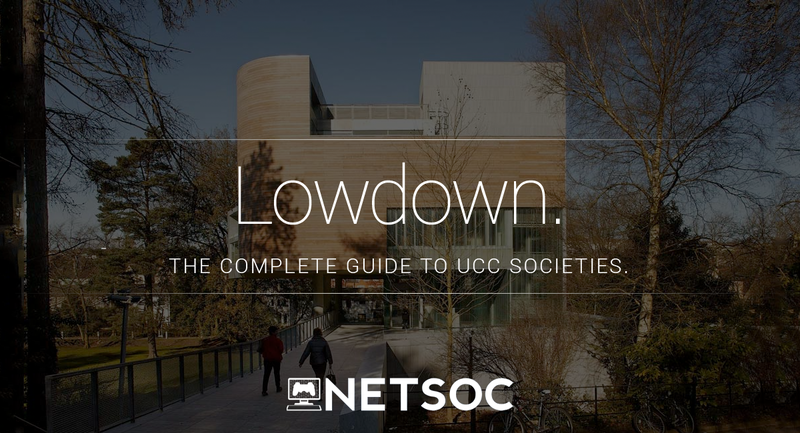 Built by the society auditor Evan Smith and finance officer Colm Cahalane, Lowdown is one of Netsoc’s first major open-source project for the year. Earlier this year, Netsoc revealed a Statement of Intent on their website that gave the ambitious promise that “we won’t stop until every student on campus benefits from what we have to offer”. With recent improvements to their infrastructure such establishing a new base of operations in Cork Internet Exchange, setting up services on a donated server from Nova Broadband and joining Ireland’s Intersocs network, Netsoc is quickly positioning itself as a service society for students. Future plans for Netsoc include to extend their services to members to include web-space, virtual machines, version control and file storage/backup for student developers. They’ve made the full codebase for Lowdown available for any students who are interested in expanding the system and seeing how it works. UCC Netsoc are holding a number of technical talks and tutorials over the upcoming year as well as weekly social and gaming events. You can find out about them on Lowdown here.